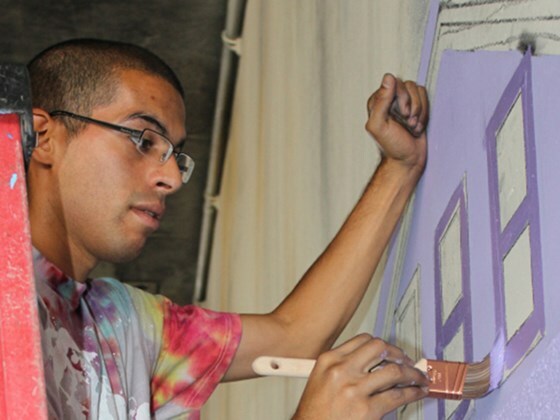 Last October young volunteer, muralist, and street artist Antonio Ramos was gunned down in West Oakland. He and his fellow artists were in the midst of painting an anti-violence mural that was meant to be enjoyed by the entire city. Designed by middle-schoolers, the piece was called “Self as Superheroes” and was part of a city-wide initiative to use the power of street art to talk about the challenges facing Oakland and its surrounding communities. Oakland is a city of opposing ideas. At once a rougher city than the nearby San Francisco, it is simultaneously heralded as The Bay Area’s own Brooklyn but also a city of danger, of systemic problems, and one that has a long ways to go. The very act of shooting a young street artist for painting a charity-funded mural seems to speak to many of the problems the city faces, and has indeed become a testament to Oakland’s many challenges. “Self as Superheroes” is part of the Oakland Super Heroes Mural Project, a six-mural project funded and started by local non-profit Attitudinal Healing Connection, which is dedicated to spreading messages of anti-violence. Every mural is painted on a freeway underpass and hopes to convey messages of anti-violence and peaceful resolution in a city where stories of gentrification are met with worrisome crime statistics. Ramos’ death was met with widespread condemnation and a city that came together. A fund was started to help his family cover the funeral costs. Those who worked on the mural finished it in his honour, and many residents came to the piece, the place where Ramos died, to pay their respects and build a small shrine in his honour. His death has become a symbol of how far Oakland still needs to go in terms of crime, violence, and a community that needs to build with its citizens. Of the many things that Ramos’ death has come to represent, from Oakland’s crime to arguments surrounding gentrification, is that art is still powerful, still relevant, and still very important. Ramos was gunned down while making art, while trying to communicate something very real and very important to the people of his town. The art, and the very act of scribbling it onto a wall, proves that street artists, as conveyors of important messages, are still feared and therefore tried to be silenced. And while the true motivations of the shooter are still a mystery, we can still see how Ramos’ passion for anti-violence lives on through his artistic contributions. One of the benefits of street art now entering multiple decades of public approval and recognition is that we are seeing artists be influenced directly by the generations previous. Years ago, street artists were often left to their own devices, unable to properly communicate or share their ideas with a larger group. And the idea of teaching the next generation was almost impossible, especially as the craft being taught was, back then, still seen as something illegal. But with time and acceptance came the opportunity for artists to build off one another generation to generation. 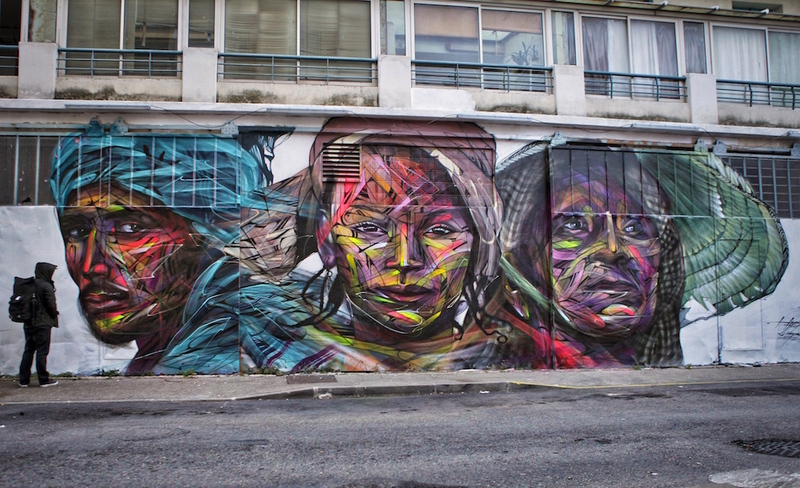 One such artist is the relatively young yet influential Hopare. Born in Limours, France to Portuguese parents, Hopare discovered his love of street art early on when he walked past an abandoned local factory that was covered in graffiti. He started doing his own tags and pieces not long after, around the tender age of 12, but it was a chance meeting with a teacher that turned Hopare from a kid with some spray paint to an artist on the verge of greatness. That chance meeting was with French street art legend Shaka, who was teaching at Hopare’s junior high school. The meeting proved fruitful as Shaka saw Hopare’s potential and mentored him over the next year, culminating in a show that showcased a young artist of considerable talent still in search of his identity. It was in the years that followed that Hopare began learning from other street artists while working in an interior architecture firm, all of which helped him find his now-distinctive personal blend of abstract and figurative. The Franco-Portuguese urban artist has made a name for himself not simply because of his beautiful work, but because of his inclusion of many different themes in his work, especially a familiarity with architecture that allows his work to expand beyond the canvas. Hopare’s work often leans heavily on precise geometry, creating the illusion of 3-dimensional work by combining sparse colour and effective shadowing. This precision creates pieces that figuratively pop off the canvas and capture the audience’s attention. What Hopare’s art proves is that there is a tangible and important benefit to the ongoing celebration and expansion of street art. With the increased recognition, artists have been able to more effectively come together and educate each other. The result is a history that artists can draw upon and contribute to, pushing the medium forward as artists can find themselves through the mentorship of others. This sort of process has long been vital to other creative exploits, from the Beat poets’ writing retreats to formal artistic education. Hopare’s distinctive yet cultivated style proves that artist-to-artist encounters can create beauty and forward-thinking pieces that can push an entire medium forward. A recent piece by near-legendary graffiti writer GESER (GES for short) has some people questioning the idea of corporate support and artistic integrity. The piece, a train-wide signature by an artist famous for his ability to draw large pieces, is beautiful, but it’s also paid for and made using MOLOTOW products. MOLOTOW, for those who are unaware, is a painting and artist supplies company with a particular focus on graffiti and writing. A large part of their brand is focused on the latest in spray paint technology and colours that’s made for graffiti artists and no one else. According to GESER, the technology is far and away some of the best available, with a combination of great colours, even, low pressure flow, and good coverage that can make any project much, much easier. The collaboration seems to be organic, with MOLOTOW approaching GESER about the project after discovering he used the products in his own work anyways. A proponent of the products, it wasn’t a stretch for GESER to use the products to create something truly striking and original, and his disavowal of the corporate influence speaks to both the development and creation of such work. Graffiti writing, after all, is widely seen as vandalism over art, and with this all-too-common misconception, the graffiti community often reacts against mainstream influence. It appears in a number of ways, from ignoring anti-graffiti laws to refusing to work with larger companies who want to “cash in” on graffiti’s counter-culture place in the art world. No matter the reasoning, however, GESER’s opinions are that good work can come from a number of places, including big companies. “I don’t mind doing occasional jobs/walls for money,” GESER said in the interview, “But I must say that turn down quite a bit of commission work due to the frustration of dealing with low-ball clients who can’t articulate what they are looking for. It usually results in a frustrating experience.” The takeaway is that smaller clients are perhaps more frustrating than larger ones, that the bigger guys pay their bills, provide bigger opportunities, and can help artists reach bigger audiences.